Are you expected to tip the 'driver'? When it comes to alternative ways to deliver pizzas, Domino's is not afraid to think outside the box. Last year, the pizza company successfully pulled off the world's first commercial delivery of food by drone. 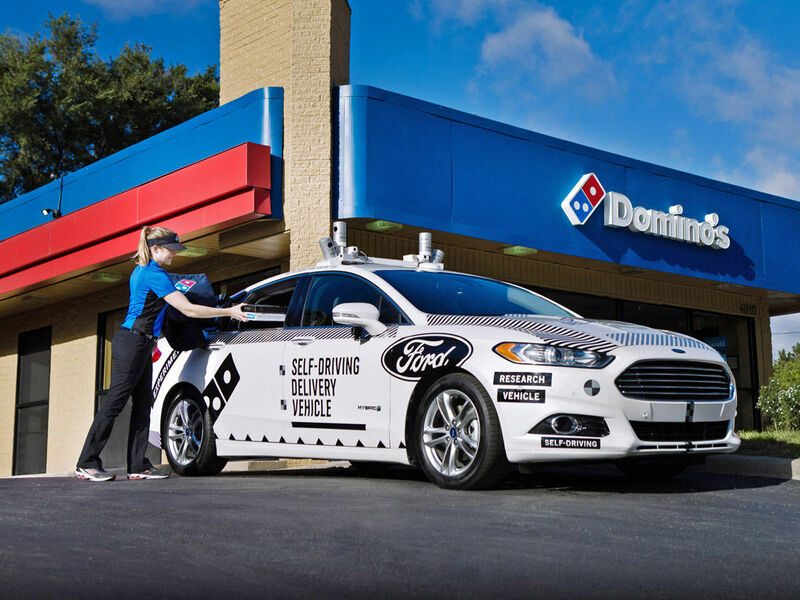 That same year, Domino's unveiled "DRU", or Domino's Robotic Unit, the world’s first “autonomous pizza delivery vehicle.” Domino's is continuing in the same autonomous vein by partnering with Ford to deliver pizzas using the Fusion Hybrid. The partnership outfits Ford's autonomous Fusion Hybrid vehicle with pizza containers (called Domino's Heatwave Compartment) created by Roush Enterprises. Along with keeping the contents piping hot, the containers are also designed to unlock once a customer types in a unique delivery code. Customers in the Ann Arbor, Michigan, area will be randomly selected to opt-in to the autonomous delivery service. Once signed up, hungry participants will receive a text when their order arrives. Technically, the Fusion won't be human-less. The vehicle will be manually-driven by a Ford safety engineer and staffed with researchers. The experiment is part of a larger research project to test how people will react to receiving pizzas via self-driving vehicles. According to Sherif Marakby, VP of Autonomous and Electric Vehicles at Ford, the customer and user experience is a core part of the autonomous driving platform that it's creating. Using a real-world test will help gauge assumptions and possibly allow Ford to commercialize their autonomous platform in only a few years. The results from this trial will hopefully inform Ford of what would be needed in order to satisfy consumer needs and demands from an autonomous service.